NORMAN WHITESIDE never shied away from the big occasion. At 16 he became the youngest player to ever step out for Manchester United, while at 17 years and 41 days – still not legally able to purchase a drink from his local off-licence on the Shankill Road in Belfast – he displaced none other than Pelé as the youngest footballer in World Cup history. Whiteside was a case study in physical trauma, as his promising career was cut short, cruelly, by severe injuries to his knee and achilles that simply took their toll on his body. At 16, Whiteside became a superstar at one of the biggest clubs in the world, but just a decade later, he was holding back the tears as he announced his premature retirement from professional football. 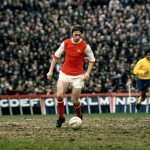 Hanging up his boots in his mid-20s after a sparkling career, Whiteside entered the reluctant club of football’s fleeting fraternity, joining his compatriot George Best as a footballer of immense natural ability, whose stay at the top was regrettably ephemeral. Whiteside was born in Belfast on 7 May 1965 and grew up on the Shankill Road. On the streets of Belfast, Norman honed his skills from an early age and his development as a physical player, with a genuinely aggressive streak, earned him the nickname ‘Shankill Skinhead’. In the late 1970s and early 80s, Whiteside deservedly earned a reputation as a rising star of Northern Irish football. He continued to grind away in the unglamorous amateur leagues of Belfast until he was spotted by Bob Bishop, the legendary Manchester United scout responsible for bringing George Best and Sammy McIlroy to the Theatre of Dreams. A quiet, unassuming Ulsterman, Bishop was responsible – along with chief scout Joe Armstrong – for supplying Sir Matt Busby with a conveyor belt of exciting talent. Known affectionately as ‘The Bishop’, when he cast his keen eye over the imposing presence of Whiteside on the football pitch, he knew he was a star in the making. “Never mind my grandad, he was old enough to be my great-grandfather, but he had such a sparkle and a gift for communication with young footballers that it never felt as if you were dealing with an old man,” Whiteside later recalled of the scout. While he was responsible for an endless stream of quality flowing into the United ranks, one of Bishop’s finest discoveries was Whiteside. Bishop later recalled how Whiteside impressed him in one trial match when he was taken off after 20 minutes after scoring seven goals. Frankly, Bishop had seen enough: Whiteside was exactly the gifted footballer he was instructed to find by his employers. From leaving school at the age of 16, Whiteside suddenly found himself at one of world’s biggest football clubs, training with men nearly twice his age. A prospect enough to daunt most, Whiteside took it remarkably in his stride, quickly earning the admiration of his peers for his adaptability to the professional game. 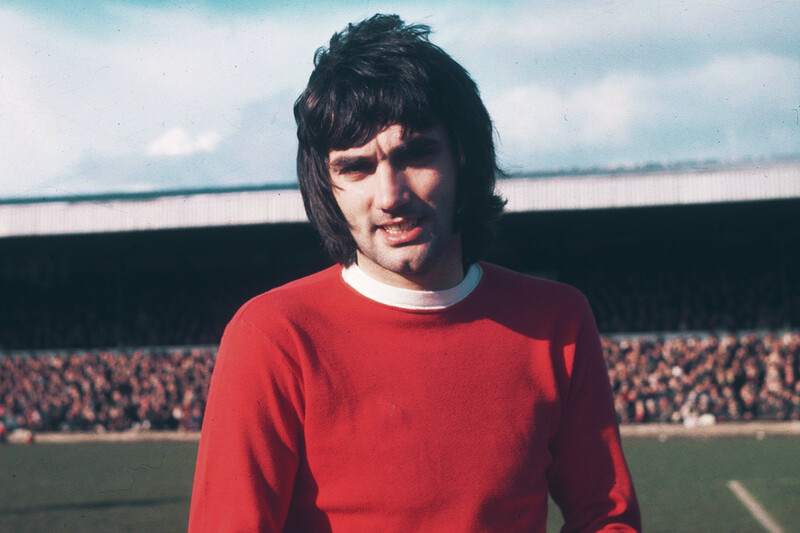 Before long, he became a household name, and a cult hero to the fans of the Stretford End, revered for his tremendous composure and poise in possession. Whiteside played football with his brain first and his eyes second – always seeming to know exactly what he wanted to do with the ball before it arrived at his feet. Dave Sexton signed the youngster but was sacked before he could watch his prodigy become a star. The injuries, unfortunately, were already starting to stack up for the Belfast native, though, as he underwent an operation on a cartilage in his knee at the beginning of his United journey. Managing to overcome that setback, Whiteside was given his chance to shine in the reserves. Impressed immediately, Ron Atkinson – who succeeded Sexton – thrust him into the spotlight of first team action. Just three days after playing in the youth cup final loss to Watford, Whiteside made his league debut for United, against Brighton in April 1982, while he was still only 16. He played in one other game that season for United, scoring in his home debut against Stoke. He was becoming a fans’ favourite, a young starlet ready to take on the world with a United team searching for supremacy over the all-conquering Liverpool side of the 1980s. While tasting barely two hours of league football, Billy Bingham was convinced of Whiteside’s competence at such a level and included him in his final 22-man squad for Northern Ireland’s trip to the 1982 World Cup. Bingham had originally thought of bringing Whiteside to Spain with the purpose of gauging his progress in training. He wasn’t a guaranteed starter, but Bingham had the suspicion that Whiteside was going to make an impression. His forecast turned out to be prophecy, as Whiteside was the outstanding player during Northern Ireland’s pre-tournament training camp in Brighton. In one particular practice game, Whiteside produced a goal of stunning quality, curling it expertly around the massive hands of Pat Jennings, who told Bingham he was in shock of how the youngster had struck the ball. Delighted by the 17-year-old’s blossoming brilliance in training, Bingham had decided, before the national team left their training camp, that Whiteside was to be part of his starting line-up. It was a massive call to make, but it goes to show how much the youngster had flourished. Whiteside’s maturity astonished Bingham, who was beginning to see the fledgeling member of the national team as crucial to Northern Irish success. The 1982 World Cup, like it was for every Northern Ireland player, was a wonderful experience, and an incalculable two-and-a-half weeks of education for Whiteside. Displacing Pelé as the youngest player to ever appear at a World Cup was one thing, but Whiteside started all five of Northern Ireland’s games, as he and his compatriots became heroes back home for their courageous exploits in Spain. Whiteside, as they say, put himself about in those matches, unmoved by the fact he was up against players of world-class pedigree like Michel Platini of France or Juanito of Spain. In fact, it was the latter who incurred the physical wrath of a fearless Whiteside, when he sent him crashing into the advertising boards during Northern Ireland’s unforgettable victory over the hosts at the Estadio Luís Casanova (now the Mestalla) in Valencia. Although the Green and White Army were ultimately overpowered by a brilliant French side 4-1 and were eliminated, Whiteside had embraced his World Cup odyssey with open arms. He left for the World Cup a boy and returned to United a man. A real footballing man. 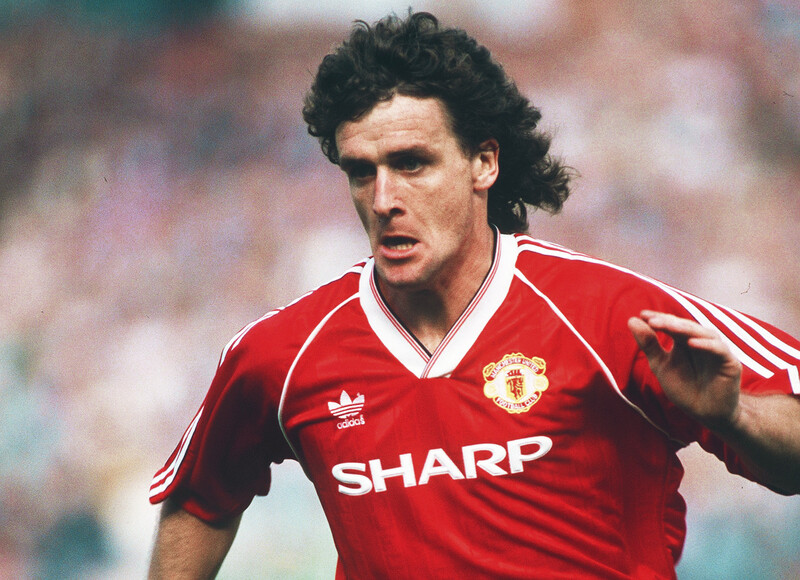 During the 1982/83 season for United, Whiteside grew to become one of the most consistent performers for Atkinson’s men, forming a productive partnership in attack with Frank Stapleton. The duo, along with the leadership of Bryan Robson, got United off to a flying start that season. Whiteside picked up where he had left off before his travelling to the World Cup. His ability to drift past challenges seamlessly mixed with a devastating finish catapulted him to heroic status that season, continuing his excellent progress despite still not reaching the age of 18. Although Whiteside experienced something of a drought in the middle of the season, it was once again that knack for the big occasion that shone through. In what was an exceptional cup year for United, Whiteside proved to be the hero in the League Cup final at Wembley against Liverpool. With millions watching, Whiteside watched as Gordon McQueen floated a 60-yard pass from defence towards his totemic figure. Watched all the way by Alan Hansen – perhaps the best defender in Europe at the time – Whiteside controlled the ball effortlessly on chest before dragging it round the Scottish centre-half, leaving him hopelessly in his wake. Keeping his balance and composure in typical fashion, Whiteside buried the ball into the bottom corner, beyond Bruce Grobbelaar. Whiteside claimed in a 1986 documentary about himself that he didn’t get nervous before games, that he would feel more nerves making a pot in a snooker game with his brother than stepping out for United in front of 100,000 people at Wembley. If it was the first time you heard Whiteside speak, his words would be disregarded as conceited, but watching him glide past Hansen in that final, it seems as though the forward was just being honest. Thanks to the brilliance of Ronnie Whelan, Liverpool still managed to lift the League Cup on that fateful afternoon, but just three weeks later, Whiteside had Wembley in his sights once again; his beautiful volley in the FA Cup semi-final against Arsenal put United into their second final in the space of a month. While the initial affair against Brighton finished 1-1, history was in the making once more for Whiteside, who met an Alan Davies cross with a perfectly executed glancing header, propelling United to a famous cup victory. Whiteside was the ultimate big game player that season, scoring in the club’s two semi-finals and two finals as he relished the opportunity to excel in the big games. Naturally, his consistency attracted interest from abroad and he was offered the chance to become a superstar of European football when AC Milan made a bid, after watching him play against rivals Juventus in the Cup Winners’ Cup. The fee of £1.5 million was a lot of money, too much in fact, for United to resist, but Whiteside rejected the opportunity to move without a second’s thought. He felt he wasn’t ready for the challenge of changing countries and cultures, and attempting to learn the language of Italian when he was still learning the language of football. Rejecting a move to Italy, Whiteside did move, however, into United’s midfield, rather controversially. While he had proven himself as a prolific marksman up front, Atkinson and the Red Devils’ coaching staff continued to express consternation over his lack of pace. While not blessed with blistering speed over short distances, Whiteside was smart and agile in his movements, rendering pace irrelevant most of the time. His telepathy with Stapleton was a massive element of United’s success in the halcyon days of his career but Atkinson’s stubbornness prevailed. Whiteside was shifted into midfield, while Mark Hughes was signed as the new man to lead the line. Ironically, it was Hughes who occupied the midfield slot in the 1985 FA Cup final against Everton, when Whiteside scored perhaps his most famous goal in a red shirt. 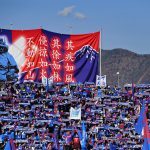 That Toffees side were the reigning cup champions, and their sustained excellence had earned them further honours with the league title and Cup Winners’ Cup. Heavily backed to defend the cup, Everton were as formidable as they came at that time for Whiteside and his United teammates, but once again, ‘Stormin’ Norman’ was unaffected by the enormity of the occasion. The odds in favour of Everton shortened even more when United had a man sent off in Kevin Moran, after upending Peter Reid in the 78th minute. Then, with the game in extra-time, Whiteside picked his moment. Cutting in from the right flank, performing a step-over and curling a superb, he whistled an effort round Everton defender Pat van den Hauwe, giving keeper Neville Southall zero hope as it flew beyond him and into the corner. “Norman Whiteside has done it … again,” cried the immortal words from John Motson for the BBC, and it summed up Whiteside’s contributions in major games. Again and again, he proved to the scorer of great goals for great occasions. Still only 20, Whiteside had etched his name into the history books yet again in one of United’s greatest ever days. 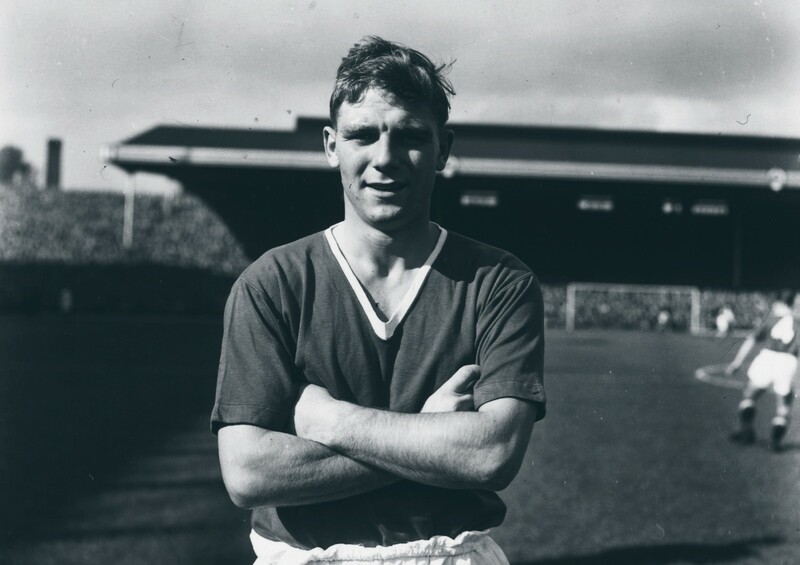 The following season saw Whiteside establish himself in United’s midfield and become the club’s youngest captain since Duncan Edwards, who was one of the eight that sadly passed away in the Munich Air Disaster of 1958. Bobby Charlton, impressed by Whiteside’s progression to become a leader of United, tipped him to continue in the same manner for many years to come. However, just two years after scoring that FA Cup-winning goal, Whiteside’s world began to come crashing down. Alex Ferguson had become United manager in 1986 and his arrival coincided with a decline in Whiteside’s career. His right knee was beginning to cause serious problems and he underwent lengthy medical procedures to prevent early retirement. Depressed and disillusioned with spending the majority of his time on the sidelines, Whiteside began to embrace the drinking culture that existed at United around that time, reportedly enjoying many boozy sessions with Bryan Robson and Paul McGrath, much to the chagrin of Fergie. When Whiteside ruptured his achilles during the 1987-88 season, forcing him to miss a year of action, his United career was effectively dead and buried. The ecstasy of making history at the World Cup and in the FA Cup final suddenly became a distant memory as Ferguson sanctioned Whiteside’s sale to Everton. While he flickered briefly at the Toffees, it was clear to any regular viewer that he was a player very much in decline. Not that he could do much about it, though; Whiteside’s body had been ravaged by the most severe injuries, leaving him desperately short of match practice. At just 26, Whiteside was forced to retire. Manchester United fans still look back on those famous finals and the days that saw the man from Belfast patrol Old Trafford elegantly with a hint of sadness. In terms of playing style, Whiteside was wholly different to his compatriot George Best, but when it comes to reflecting on the fleetingness of their time at the top, it is difficult to divorce the two. Whiteside’s time at the top was dizzyingly exciting and perhaps it all came a little too quickly, in the end, but there is no denying that, at his peak, he could be categorised as a visionary footballer and a genius. He is a true star of football’s fleeting fraternity.